Looking for ideas this year to enjoy the lights, sounds, and festivities the holiday season brings? The Argosy Christmas Ship Festival has been a Northwest tradition since 1949 with a variety of holiday cruises to celebrate, sing and dine with family and friends. From Nov. 28 - Dec. 23, you can book a tour on the Christmas Ship™ or one of the Parade Ships that follow. Or, those looking for a full meal and a private dining table there’s the Royal Argosy, or daytime Santa Brunches with entertainment just for the kids! How do you know which to choose? The following descriptions of the different cruises may help decide which is for you! The Christmas Ship leads the festival’s parade of boats each evening. 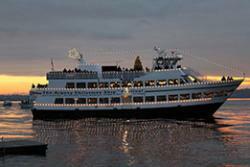 It sails to different Puget Sound waterfront communities where the choir onboard sings 20-minute performances, all broadcast via state-of-the-art speaker system. 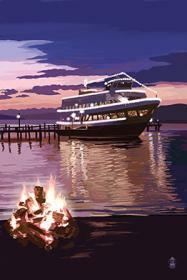 On shore, friends and neighbors gather around roaring bonfires anticipating the arrival of the Christmas Ship. Following behind, residents string lights to their own vessels to help form the largest holiday floating parade in the world! Santa rides along to entertain and a cruise director guides you through the evening and contests to win great prizes. The Christmas Ship has a kid&apos;s craft area available and snacks, chowder and beverages for purchase or you can also pre-order boxed meals. Adults $35.50, Seniors (65+) $32.00, Youth (4-12) $19.50. Under 4 FREE for all cruises. 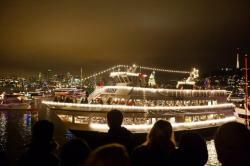 The Parade Boat is another Argosy Cruises boat that follows the Christmas Ship with the rest of the parade. It stops with the Christmas Ship to hear the choir sing to those on shore. As with the Christmas Ship, Santa will be onboard along with a cruise director guiding you through the evening with contests to win great prizes. The Parade Boat offers kid&apos;s craft bags and also has snacks, chowder and beverages onboard for purchase or pre-ordered boxed meals. Adults $25.25, Seniors $22.75, Youth $12.25. 12/23 Festival Finale $40.00. The Royal Argosy Dinner Cruise follows the Christmas Ship Parade on many nights, while you relax at your private table with a drink — or order an appetizer. You can also take a self-guided tour of the ship, or just sit and listen to the house band. Savor a three-course dinner, including a Northwest-infused buffet freshly prepared on board. The band will take breaks so you can go outdoors to listen to the choir concert broadcast from the Christmas Ship. The Royal Argosy is perfect if you prefer a private table and festive dinner party over the casual party atmosphere of the Christmas Ship itself. Adults $89.00, Seniors $89.00, Youth $39.00. 12/21, 22, &23 Festival Finale Dinners $99.00 for Adults and Seniors. Most weekends from 11am-1pm during the Christmas Ship Festival, one of the delights of the season is the Santa Brunch, a daytime family holiday event separate from the Christmas Ship Parade. These cruises feature a buffet brunch, Santa on board who reads "Twas the Night Before Christmas," and an arts and crafts area designated for little ones as well as holiday entertainment. The entertainment this year is an interactive performance-- Santa has lost his bag of gifts. Help him save Christmas and solve the mysterious disappearance of Santa&apos;s bag so we&apos;ll all have presents under our tree on Christmas morning! Adults and Seniors $49.00, Youth $22.00. There are also special one-time cruises listed on the holiday schedule. Locations and times of cruises vary so check out the website for specific details, but do so quickly! Tours are selling out and you don’t want to miss your chance to participate in this great Northwest holiday tradition.